This is a very good question. Often band flutists look haphazardly twisted and uncomfortable because they don't have enough room (often their chairs are placed too close together), enough stands, or often because they don't have sufficient posture-practice and flute-holding information to hold their flutes comfortably. Afterall, it's one of the few instruments that has to be held with the arms up in the air and then over to the side as well. Sometimes this is accomplished only with sheer determination. :>) And to a band director who wants the band to look neat and tidy (a hold-over from military bands where the players had to look ULTRA-tidy; like soldiers!) 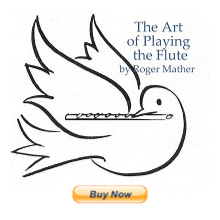 the simple fix is to insist that all flutists hold their flutes parallel to the ground. As an added bonus, holding the flute parallel to the floor just may help one or two flute students who don't actually have the flute parallel to their face. But that, of course, is just a percentage of the flute section (hopefully). Mostly it's so that the flute section looks formal, neat and precise when viewed by an audience.The general public wants a band that LOOKS SMART because they judge more with their eyes than with their ears. Upright posture also helps the band sound better as it fosters deeper breathing...but that's a whole other topic. Band teachers use "sit up and stay parallel to the ground" as a catch-all for all these things. In the real world of music performance, you need to be comfortable, balanced, and breathe easily and freely in order to play the flute well. Ergonomics of holding an instrument has nothing to do with military posture. If you want a band-director's handout that suggests an improvement to the chair positioning of the flute section to make it easier to play with good posture, plus a very important piece of information (often overlooked) about how to line-up the headjoint for those players who have trouble staying parallel to the ground, click on this link. But yes, you're right in your readings. Of course, if you look at pictures of professional flutists, you'll see that most of them hold the flute down at an angle because the arms are more comfortable this way over long hours of playing. Professional flutists play from 3 to 6 hours a day, and have been playing for decades, so needing comfortable posture is entirely understandable. But for a band that has to play a four-minute piece, however, it *is* possible to hold the flute parallel to the ground for that short amount of time. It is made even easier by rearranging the chairs so that the knees of the player are facing 45-degrees to the right, and each player has his own music stand, swivelling to the left to view it. This is rare in bands, where I find, two to three players are reading from one music stand, knees are facing the stand, and bodies are twisted in all sorts of contortions in order to see both the music and the conductor. Given this last scenario, military posture is just adding one more twist to that "Oh my gosh, I'm a pretzel" feeling. No, holding the flute parallel to the ground doesn't necessarily make it sound better but keeping it parallel to the lips DOES. Note that some if not all of your band members are still growing, and getting used to their new size and shape. This can be a challenge, and many like to slump over, droop their flutes, and slop their fingers around, making the flute section in particular look like a bunch of snoozy gargoyles who might slip off their chairs for a nap at any moment. Add to that those that have their headjoints put on wrongly, and have to double-gargoyle in order to play any notes at all, and then feel so tired that they hook their feet around the chair-legs, and put their elbows on their knees, all the while poking their neighbour in the ribs, and you have the typical band-flutist problems. So band teachers say: "Sit on the edge of your chair; sit up; heads up; keep the flute parallel to the ground" to cure all this in one fell swoop. So do what you can to inch forward, being sure to sit on the front 1/3 of your chair, feet flat on the floor, and ask if the flute sections can have individual music stands so that they can turn their chairs 45 degrees to the right. Then, to play, each player swivels the head and torso to the left to view the music. Each player needs also to see the conductor above their music, so this can take time that the band director may not have. But it sure makes it alot easier to play parallel to the floor for a few minutes at a time for the sake of the look of the band if these key points are addressed. I very much dislike stiff-parallel-military-looking flute playing (especially when it's combined with high elbows) but band teachers don't have time to correct every individual when it comes to individual comfort and ergonomics. A private flute teacher is what's needed for a special visit to help with posture/holding and comfort. As Jen has pointed out before, playing like that can wreck your body. It is usually accompanied by elbows pointing 'up', etc., and is really awkward. My flute is rarely parallel to the floor, and if it is, it is simply for a moment while I sway to the music. Very, very interesting post. Thanks for addressing this issue! So glad that the article shed some light. We often invent staged "postures" in our minds, and instruct each other on "posture" long before the physical science catches up with us and gives us the ergonomic answers. I'm sure that there's room for experimentation until we find the best ergonomics for each instrumentalist. Meanwhile, glad to help out. I nearly crippled my shoulders from early experiences in crowded seating and craning to see the music, with too few stands in a burgeoning flute section. Glad to prevent this happening to other youngsters.